You can have your say before the release of this OnePageBook on Amazon. Any and all feedback is welcome. It may shape the book before its final release. Simply post your comments here. 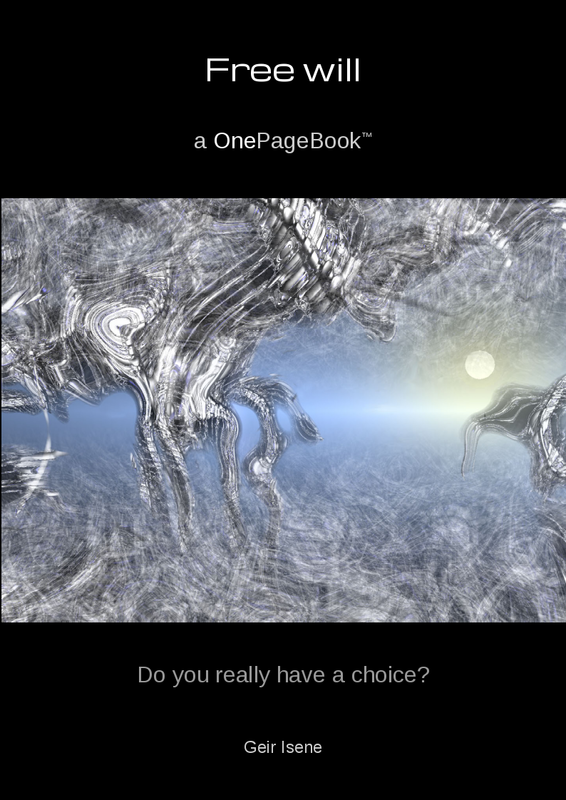 OnePageBook: Free Will – Do you really have a choice? Before the beginning, there was a cause, and a purpose of the cause was the creation of causes. This is the very beginning of person’s free will. The origin of free will could not be other than a divine one, God is great. Ho, and by the way, this solves in full the moral conflict. If you are making someone effect you are in misdeed, and the other side is the good one. Rafael, there was no beginning. Something cannot come out of nothing, not even God. Therefore it must be the case that stuff-in-motion is eternal. Stuff would include all forms of matter, from an infinity of universes to the smallest part of the smallest part. Motion would include naturally occurring transformations. For example, black holes, which are super-condensed matter, accumulate into a single ball until they reach a tipping point. Then Big Bang. They explode into another universe. And then the cycle begins again. — At least that’s one theory. Yes, there are a lot of theories, included that of parallel universes. All of them created out of nothing. Well, we have an actual example of how it has happened at least once. Ok, probe your theory: …. The current example of the universe having started with a Big Bang is scientific common knowledge. You can read about it in Wikipedia. But what came before the Big Bang is speculation. There’s many theories (including yours) but none of them can be proven, so I can’t offer you any proof. Just speaking about “this” universe, Everywhere there was nothing and then Everywhere there was something which was energy which took about 350 years to cool down enough for matter to start forming. Whether or not consciousness was included in that creation is a matter of opinion. It might follow that a “formless God” (a term from Wilber) would choose to be at “the center” of everything which is between my ears and everyone else’s ears. What is forever missing from this notion is certainty regarding free will. You aver that we either have it or we don’t. But we cannot logically assert whether we can know we have it or not. So what DO we have? We have a STORY of free will. And that is all. We either have it or we don’t but the story is exactly the same. One rule to unite us – live in agreement to nature. 1. The good is the virtue evil lacks. All the rest is indifferent. 2. Good and evil are in the will – only will is in our power. Hear the sage inside us: Practice. Practice. Practice. Practice. Here is a book that breaks down the teachings of this meme. After all, if we have a free will, then we can only use what that will is empowered to do and nothing else. One thing also to consider. Why use a free will if we have one? What good does it do? My answer to this is that we can use a free will (or a story of free will) for the sake of virtue. And what is the point of “virtue” of being “good”? For. The. Enjoyment. And. Rejoicing. Within. Our. Souls. Most people are “good” for a god, a spouse, a boss, but SO SO seldom just for themselves and that is the greatest waste of all. At the end of the day, we should take pride, pleasure and comfort in the good we do. Wrap it around us like a blanket and sleep like a baby and purring like a smug kitten. THAT, IMHO, is what a free will story is about. Free will is empirically observed. Free will refers to those decisions where we decide for ourselves what we will do, free of coercion or other undue influence. So, a woman sits down in a restaurant, browses the menu, and then gives the waiter her order. You’ve just empirically observed free will. On the other hand, if someone enters the restaurant, stands behind her with a gun to her head, and says, “Order the chicken salad or I’ll blow your brains out”, then we empirically observe an unfree will. Now, we also empirically observe what appears to be a deterministic universe, where causes (physical, biological, and rational) appear to determine all events in a reliable fashion. And this is a good thing. Because without reliable cause and effect, we could not reliably cause any effect. (Yes, please read that at least twice). So, without reliable cause and effect we have no freedom to do anything. Therefore, all freedoms, especially free will, REQUIRE a deterministic universe. There are two facts: (1) We make our choices according to our own purpose and our own reasons (free will), and, (2) Our own purpose and our own reasons will reliably determine our choice (determinism). Both of these facts are simultaneously true. “Free will” refers to the practical distinction between a choice we make for ourselves versus a choice imposed upon us by coercion or other undue influence. This is the distinction required to establish moral and legal responsibility (the most direct and meaningful cause of the harm that we need to correct to avoid future harm). To be meaningful, the word “free” must reference some relevant constraint. For example, a bird can be set free (of its cage), a slave may be set free (from his master), a prisoner may be set free (from jail), a bank may offer you a free toaster (free of charge) if you open an account, we enjoy freedom of speech (freedom from political censorship), and a person can decide what they “will” do, “free” of coercion or other undue influence. “Free will” does NOT mean “freedom from reliable cause and effect”. Without reliable cause and effect we could never reliably cause any effect, and would not be free to actually do anything at all. The will would be unable to reliably implement its intent. Hope that helps. (If you need more, visit my blog). 1.Do you think that we are some kind of entities? If yes, do you think we are static and unchanging or dynamic and changing entities? 2.If we were spirits/souls why we have so many uncontroled, random and unwanted thouhts? And why our thoughts just appear in mind? 3.We all have bodies. So how could we apply free will (in the case it exist) when body has so many processes not fully controled by us (thirst, hunger, respiration, cell growth…)??? 4. Do you think that it is possible that there are not static and unchanging entities (spirits, souls) after all? 1. Yes. I think it is neither static, nor changing as these are physical concepts. 2. Because of identification with the physical universe. 3. There are slivers of free will left in each of us – that which is still not fully identified with some physics. 4. We will find out as we die. Hi Geir and hi everyone. The topic seems pretty controversial, with the famous Libet experiment wich seems to show that the action start before in the brain and we become aware of it only when the action is already started. I find this quote from Sam Harris pretty interesting: “Thoughts simply arise in the brain. What else could they do? The truth about us is even stranger than we may suppose: The illusion of free will is itself an illusion”. If the above is true, than i don’t even know if we can make some sense of it and grasp the concept. The line of reasoning of emergence is, I believe, debunked by this very book. Dam Harris’s quote boils down to him saying “What else could they do?” That statement is so revealing as to render him irrelevant in this field. Thanks for the answer Geir. Perhaps he is too extreme? 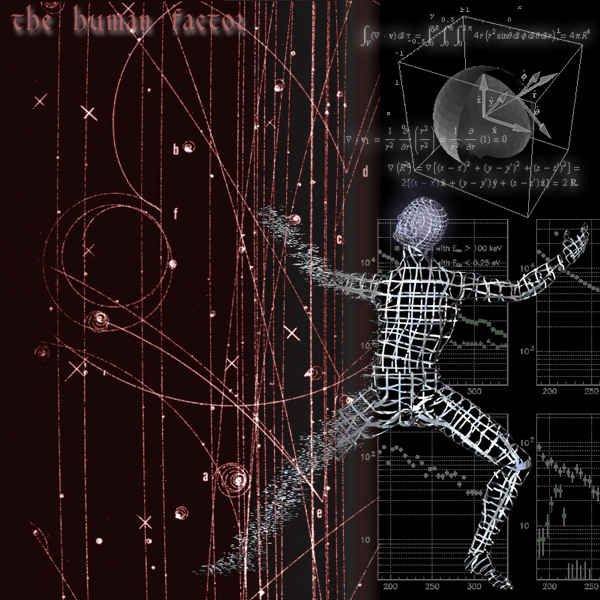 His admission that he cannot fathom anything outside the realms of physics and bases his arguments on his inability to imagine something outside this sphere is precisely what disqualified his line of reasoning. Not to mention that Harris’s “Free Will” is wrong on so many points. For example, his suggestion that thoughts simply appear mysteriously in our minds. If you’ve ever planned a vacation you know exactly where thoughts come from. Your intent searches for experiences and information related to that task! And since that intent is yours, it is you that is causing those thoughts to come to mind. It’s not a mystery. I’d say that’s only part of the explanation. Another part is that the energy manifestations in the environment (sounds, sights, etc.) that match up with the energy manifestations of recorded “thoughts” (i.e. recordings of experiences) can also cause thoughts to come to mind – similar to how a tuning fork works. I try not to believe in ghosts. On the other hand, my mother used to say that she walked into a thought. But, from my point of view, reality is enough to deal with. If I want spookiness I’ll watch a movie. Speaking of which, “5 Million Years to Earth” is on right now (recorded from TCM). It’s one of the scariest sci-fi movies I’ve seen. Want spooky? Read up on the Double Slit Experiment and the Delayed Choice Experiment. I’ve encountered the double slit several times already. By “delayed choice” are you talking about Libet’s experiments? Good grief. Is Wheeler suggesting psychokinesis?? That seems like a comical way of addressing the “it behaves differently if you measure it” problem. I don’t know physics from a hole in the ground, but my skepticism suggests there must be a more reasonable explanation (such as the effects of the measuring instrument upon the relatively feather-weight of an electron, or perhaps the instrument’s charge). Wheeler’s thought experiment was proven only a couple of years ago. It is fact. One reason we have thought experiments is because they cannot be carried out in the real world. If a thought experiment could actually be performed in reality, then we’d no longer be just thinking about it, we would actually do it, and know the answer. For example, it would be impossible to remove the screen in step 4 of the diagram, because we’d have to do that faster than the speed of light. So, that thought experiment has never been actually performed. Another problem with that experiment is that the telescopes are unidirectional but the screen is omnidirectional. So they are not even looking at the same thing. You would need a “screen full of telescopes” to get the same view as you have on the screen. The most likely explanation for the double-slit results is that the experiment showing wave behavior is simply using different apparatus than the experiment showing particle behavior. And this is clearly demonstrated by the different viewpoints of the screen versus the two telescopes. My assumption when reading about the double-slit experiments was that they were using some device placed on each of the two slits in order to count the photons coming through each slit, and that the counting device was affecting the behavior of the photons (how do you count photons without re-directing some of them through the counter? how do you count electrons without absorbing some of their charge?). I sincerely doubt that anything going on in the experimenter’s head has any effects upon anything, except the interpretation of the results. I would suggest a lot of skepticism about that article. The language is misleading and I suspect it was written in a way to catch your attention. Note this sentence: “When the imaging laser was off, or turned on only dimly, the atoms tunneled freely.” This suggests the laser was influencing the behavior of the atoms, and not whether someone was looking at them. With an STM you can even pick up individual atoms and set them down someplace else. Do you have a background in physics? If not, keep on reading up on QM – like The Heisenberg Uncertainty Principle, Schrodinger equation, wave function collapse, Copenhagen Interpretation, Wigner’s friend, loop quantum gravity, etc. Physics has nothing to do with free will, Geir. Free will is when a person decides what they WILL do, FREE of coercion or other undue influence. It has nothing at all to do with physics. The causation in determinism comes in at least 3 separate forms: physical (passive behavior), biological (purposeful behavior), and rational (deliberate behavior). Physics can explain why the apple fell on Newton’s head, but it cannot explain why the apple ended up in Johnny’s lunchbox, 50 miles from the tree. Nor can Physics explain why a car stops at a red light and proceeds again on green. This is not controlled by any physical law, but by a social law covering the operation of motor vehicles on public streets. The laws of physics are never broken, of course. The problem is that the laws of physics simply do not cover all types of behavior. Feel free to visit my blog at marvinedwards.me to read more about it. But – there is an avid link between free will and physics, lest the will that is free could never accomplish anything in this universe, right? Of course. Like the song says, “We live in a material world”. However, material organized as an inanimate object behaves passively, material organized as a living organisms behaves purposefully to survive, thrive, and reproduce, and material organized as an intelligent species has sufficient neurological evolution to imagine, evaluate, and choose for themselves what they WILL do when FREE of coercion or other undue influence. And these intelligent organisms call this ability “free will”. And when we ACT upon that will, we are Forces of Nature, changing what happens next, in the same fashion as the Sun curves the path of the planets. It’s not magic. It’s requires no ghosts or other supernatural beings. Free will is simply a property of objects in which matter is organized in such a way that it has a purpose of its own and a choice as to how it goes about achieving that purpose. Ah, here it is in the Wikipedia article: “or a particle-consistent manner depending on the experimental arrangements that ask these “questions”.” So he’s thinking like I was! It’s most likely the setup for measurement. Hey! I just noticed in your About that you do computer programming. I totally lack art skills but I wanted to create a marbling image for background on VB forms (possibly before your time). The background on my website (marvinedwards.me) was produced with my Patterns program. (BTW my idea of free will is in line with that of Martin). if you have time give it a watch. Our mental model of reality is neither a “lie” nor an “illusion”. It is a tool for survival that must give us a sufficient grasp of ourselves and the real world to enable us to find food and to avoid walking off cliffs. If it did not correspond sufficiently to reality, we’d be dead. I’m hungry, so I go to the refrigerator and get an apple to eat. Both “I” and the “apple” exist in the real world. So my mental model is not lying to me. Now, if I saw a hologram of an apple, I might try to pick it up, but my hand would go right through it. That is what we call an “illusion”. Thanks Marvin for pointing out that interesting work and i agree with you. The only thing that i keep seeing in these guys (such as Sam or the author of that video) is fixed idea, perhaps confirmation bias? I mean they come forward with phrase like “it is like that it is proven ecc…” but it isn’t the truth, these subject are vast and complex and there are still debate on it… of course you can have your opinion, but don’t force your idea on other.